Real-time data processing and subsea immediately. Looking for anomalies has imaging comprise another important historically been done post-processing, area – integrating the cameras and sen- which takes up time and involves extra sors to the ROVs to provide real-time vessel days and personnel days. 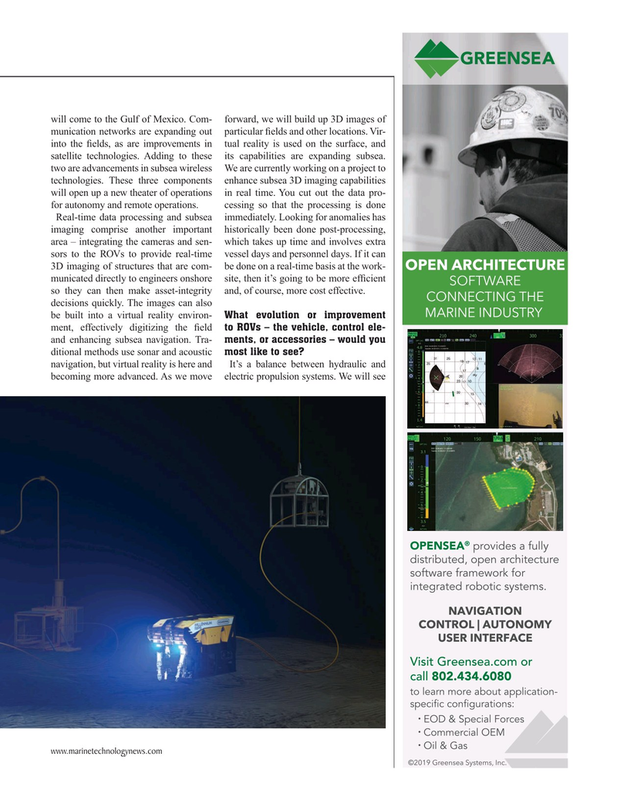 If it can 3D imaging of structures that are com- be done on a real-time basis at the work- municated directly to engineers onshore site, then it’s going to be more ef? cient so they can then make asset-integrity and, of course, more cost effective. decisions quickly. The images can also be built into a virtual reality environ- What evolution or improvement ment, effectively digitizing the ? eld to ROVs – the vehicle, control ele- and enhancing subsea navigation. Tra- ments, or accessories – would you ditional methods use sonar and acoustic most like to see? OPENSEA provides a fully distributed, open architecture software framework for integrated robotic systems. Visit Greensea.com or call 802.434.6080 to learn more about application- specific configurations: • EOD & Special Forces • Commercial OEM • Oil & Gas www.marinetechnologynews.com ©2019 Greensea Systems, Inc.